In 1942, Margaret Leech won a Pulitzer for her book Reveille in Washington 1860-1865. The book was one of the first--maybe the first?--to describe Washington as a living, breathing, and, it would have to be said, smelling place, filled with characters large and small. Reading it now, I am also struck by two things: the 1940s-era lens of Leech's language referring to African Americans and the lack of explicit sourcing. Regarding the latter, I don't doubt that her descriptions are rooted in documentation, but nowadays, the book would have included extensive endnotes for people like me to pore through! The topic of Washington during the Civil War continues to fascinate. Yesterday, I went to an author's event at Politics and Prose, where author Mark Ozer talked to a filled house about his just-published book Washington and the Civil War. He described Washington as the seat of government, seat of war, and--especially--seat of wartime memory. 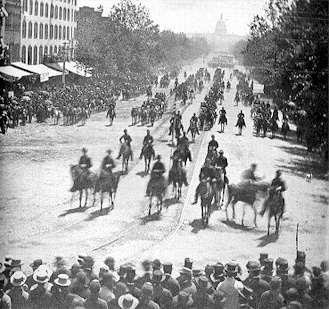 The statues of general on horseback, the images of blue and gray reconciling, the interpretation of Lincoln as the preserver of the nation--all these, he said, created a narrative that ignored the aspect of Emancipation that should also be part of wartime memory. The fairly new African American Civil War Memorial and Museum (2925 Vermont Ave. NW) was the first tribute to the USCT in Washington. There's also Hospital Sketches by Louisa May Alcott (glimpse of her experience as a nurse) and My Name Is Mary Sutter by Robin Oliveira (fiction, based on the story of a female surgeon, a rare breed indeed). Which Washington-centered books do you recommend to others?